The US National Archives is holding a very unique Augmented Reality Photo Contest through January 21, 2011, inviting people to mashup photos from the National Archive with real time photographs. I figured there’s no better tool for that than the LookBackMaps iPhone app! 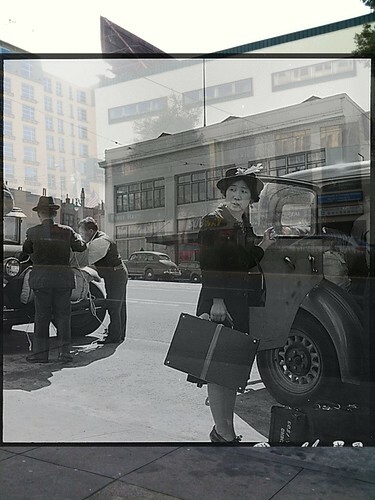 I was able to geolocate several amazing Dorothea Lange photos documenting the beginning of the Japanese American Internment of WWII in San Francisco. I think you’ll agree that these amazing images have even more impact and meaning when you see it transposed over the same view from today and reflect on the enormity and injustice of this event in American history. Then imagine squatting on the sidewalk in front of the Japanese American Citizens League, a nondescript building near Japantown, or in front of a Jiffy Lube on Van Ness, and seeing this history come to life in front of you! 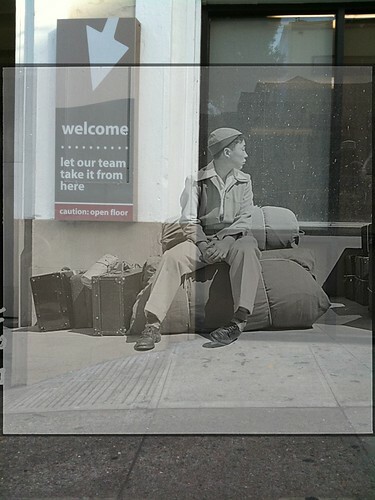 Boy awaiting bus to internment camps. Click on the images to see them in greater detail and read more about them on Flickr, and select them as a favorite on Flickr to cast your vote for getting these images into a National Archives postcard book! While you’re at it, check out the other great then & now photos entered into the contest in the History Happens Here Flickr group. And here’s a hint for finding great photos in the National Archives near you: they just unveiled a new search site that makes it a lot easier to browse through their holdings! Let me know if you’ve added National Archives photos to LookBackMaps that you’d like to see on the iPhone app and I’ll push them through. The more entries for the contest the better! [UPDATE] Two of the LookBackMaps entries were selected as finalists in the competition and will be featured in the NARA postcard book for sale in their gift shop and online soon! See all of the finalists here. 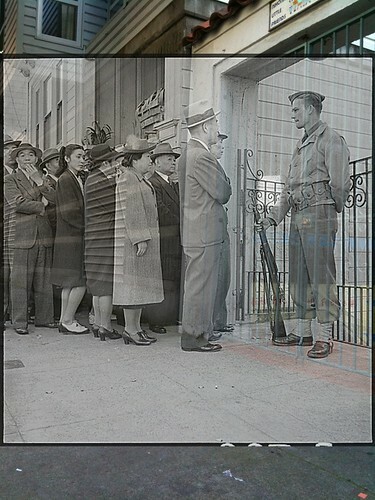 Japanese Americans arriving in April, 1942 for transportation to internment camps.